Apr 11 What is the purpose of flowers? As a florist, this is probably the easiest question I would ever need to answer. OF COURSE THEY MATTER! But for everyone else, well, it may not seem so black and white at first. Today, I’m going to illustrate the answer to this important question in three different ways. Think back to the most recent wedding you attended. Which three things about the event did you notice first or remember the most? If I had to make a guess, you'd probably say that one of those three things would have been the flowers. Am I right? When people think of weddings, most try to conjure up the most magical, heavenly day as they dream of two people beginning a new chapter in their life story. Though, realize this may be a little different for women than for men! As a woman myself, I remember dreaming of what my bouquet would look like as I carried it down the aisle in one hand while holding my father's arm with the other. I dreamt of walking into my wedding reception and seeing everything come together _ from the cake to the table centerpieces to throwing the bouquet and who might catch it! In all honesty, I believe a man would think of his wedding day as being filled with bliss and romance, too. From his mother pinning the boutonniere onto the lapel of his jacket to watching his bride walk toward him down the aisle. “But, flowers are soooo expensive,” clients may tell me. Well, yes and no. Every bride and groom decide on their wedding budget, and flowers are another piece of that pie. Frankly, the price you pay for your wedding flowers is really up to YOU. Flowers are beautiful whether you’ve budgeted $700 or $7,000 for your wedding day florals! The job of a wedding florist is to help create that magical, heavenly atmosphere through the floral pieces within your budget. Personally, working within different budgets respective to each of my clients is challenging and exciting for me! Every client has a unique style and it is my job to design floral pieces that tell their story. Also, wedding flowers are allowed to have more than just one performance. It is a common tradition for wedding guests to take home table centerpieces where they can be enjoyed in their own home for several more days. Remaining flowers may also be donated to hospitals or nursing homes to help brighten patients’ days. Another way wedding flowers can be repurposed is at the bride and groom’s family brunch the morning after. There are countless ways for flowers to live on past the wedding day. The best part is that YOU get to be creative and decide how you’d like to use them best! This one may be obvious to some people and a bit tricky for others. Funerals are expensive and are usually a time filled with sorrow and not much joy. Though some people may choose to forego flowers for a funeral, they are still a common appearance at most celebrations of life. Think about it. 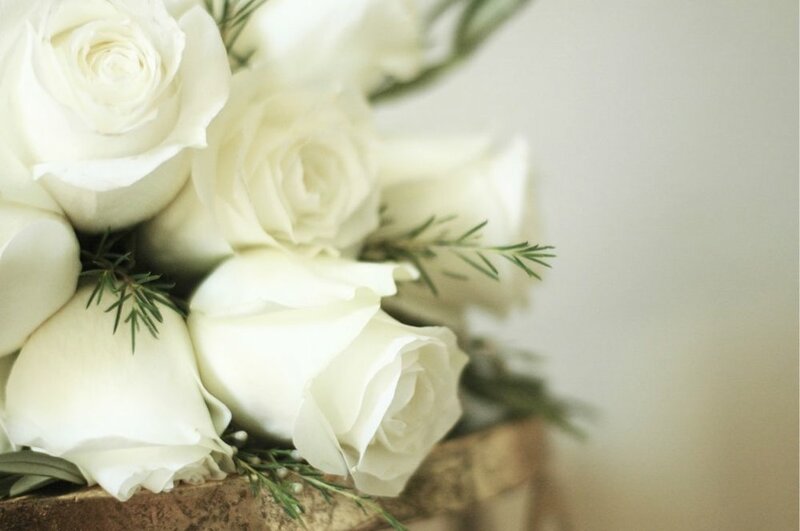 The literal category for funeral flowers is called “sympathy.” Many people can be unsure of what to do or say when a loved one is ill or passes away. Even if you don’t know much about flowers, they are still viewed as a universal sign of joy, happiness, and love. Flowers themselves are a symbol of our own human lives. We are born, we grow and mature, and we eventually die. Even after flowers have faded away, we can still remember the joy they provided for the people who were able to experience them and witness their presence with their own eyes. To put this even more into perspective, my grandfather experienced a stroke three months ago, and he lives halfway across the country from me. Though I was unable to visit him while he was in the hospital, I sent him a photo of a floral arrangement I had designed. At that point, he was still unable to speak and had limited mobility, but I was told he smiled when the photo of the flowers was shown to him. Now, that is powerful. Being a woman, this one’s a piece of cake. DUH! Before I started my career as a florist, my then-boyfriend-now-husband would send or bring me flowers many times…and I LOVED IT. I mean, honestly, what girl doesn’t wish her man would come home to her with a dozen roses just because?! To give you a little glimpse into our relationship, we have been married since 2012 but dated long-distance for over two years. One of my favorite memories of when we were dating was when I would receive a dozen (sometimes even two dozen!) roses from my love. It would make my day every single time, and I would be giddy and all smiles for the whole rest of the day! Even now, I still love it when he brings flowers home to me. And men, please listen to and believe me that you are not wasting your money when you decide to bring flowers to your lady! She will love you even more for it and appreciate you thinking of her that day! So, to answer the million dollar question: YES, flowers do matter! If you were skeptical before reading this post, I hope you know hold a different perspective! Wellspring Floral strives to spread joy to others through flowers! Sole owner and designer, Morgan Elliott, is a true artist at heart. As a classically trained violinist and former music teacher, she knows just how much the details really count! Her design style is autographed with excellence and elegance while also showcasing the unexpected. Morgan has been a Team Flower Member since September 2017.